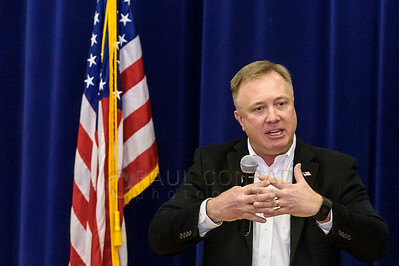 Sen. Doug Ericksen (R-Ferndale) fields questions during a town hall meeting on Saturday morning Mar. 4, 2017, at Meridian High School in Laurel, Wash. Sen. Ericksen fielded questions from constituents during the standing-room only meeting as hundreds packed the auditorium beyond capacity. 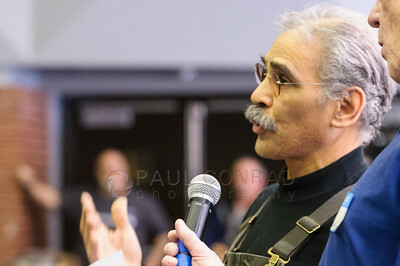 Topics ranging from water usage, water quality, renewable energy, and public education were discussed. 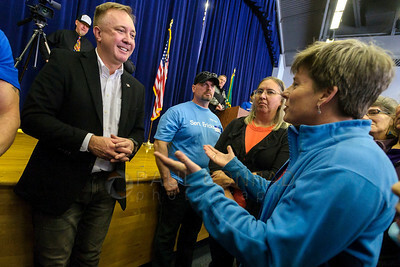 Sen. Doug Ericksen, left, listens to constituent Jackie Caplan-Auerbach of Bellingham, on right in blue, after a town hall meeting on Saturday morning Mar. 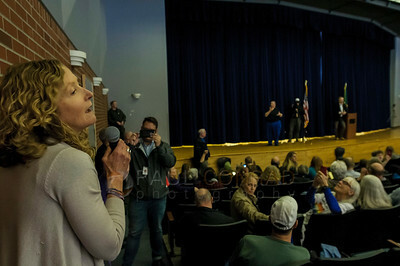 4, 2017, in the auditorium at Meridian High School in Laurel, Wash. Sen. Ericksen fielded questions from constituents during the standing-room only meeting as hundreds packed the auditorium beyond capacity. Topics ranging from water usage, water quality, renewable energy, and public education were discussed. 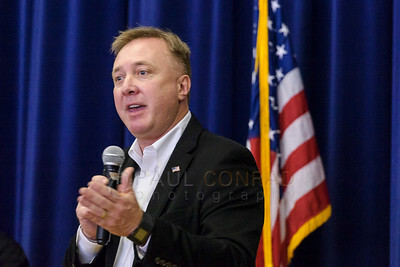 Images of a town hall meeting with Sen. Doug Ericksen (R-Ferndale) on Saturday morning Mar. 4, 2017, at Meridian high School in Laurel, Wash. Sen. Ericksen fielded questions from constituents during the standing-room only meeting as hundreds packed the auditorium beyond capacity. Whatcom County Superior Court Judge Raquel Montoya-Lewis recently there were insufficient grounds for a recall effort against Sen. Ericksen. A group of voters from the 42nd District began the recall effort against Ericksen on Feb. 9, saying he wasn’t adequately doing his job as a state senator while also working in Washington D.C., as part of President Donald Trump’s transition team at the EPA. 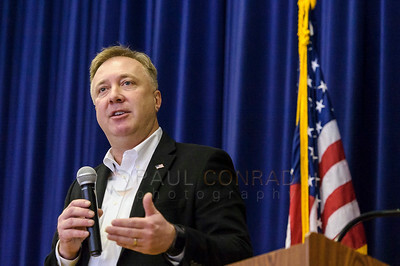 Sen. Doug Ericksen (R-Ferndale) discusses the current Washington state legislature's agenda during a town hall meeting on Saturday morning Mar. 4, 2017, at Meridian High School in Laurel, Wash. Sen. Ericksen fielded questions from constituents during the standing-room only meeting as hundreds packed the auditorium beyond capacity. Topics ranging from water usage, water quality, renewable energy, and public education were discussed. 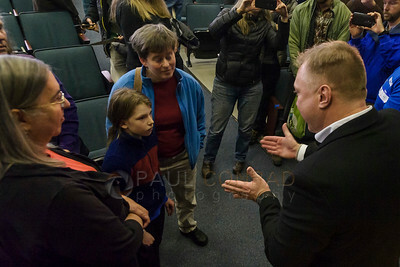 Images of a town hall meeting with Sen. Doug Ericksen (R-Ferndale) on Saturday morning Mar. 4, 2017, at Meridian high School in Laurel, Wash. Sen. Ericksen fielded questions from constituents during the standing-room only meeting as hundreds packed the auditorium beyond capacity. 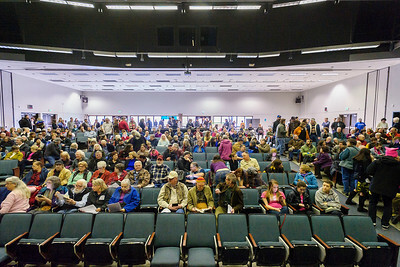 Hundreds of constituents pack into the auditorium at Meridian High School during a town hall meeting with Sen. Doug Ericksen (R-Ferndale) on Saturday morning Mar. 4, 2017, in Laurel, Wash. Sen. Ericksen fielded questions from constituents during the standing-room only meeting as hundreds packed the auditorium beyond capacity. Topics ranging from water usage, water quality, renewable energy, and public education were discussed. 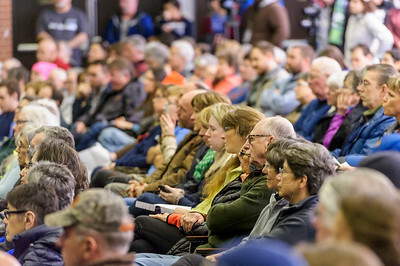 Hundreds packed a town hall meeting with Sen. Doug Ericksen (R-Ferndale) on Saturday morning Mar. 4, 2017, at Meridian high School in Laurel, Wash. Sen. Ericksen fielded questions from constituents during the standing-room only meeting as hundreds packed the auditorium beyond capacity. Topics ranging from water usage, water quality, renewable energy, and public education were discussed. 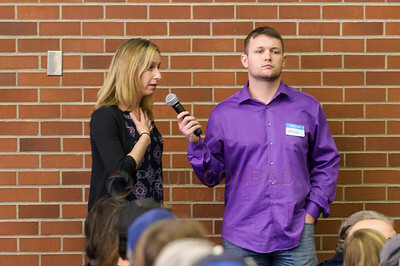 Sen. Doug Ericksen (R-Ferndale) answer questions during a town hall meeting on Saturday morning Mar. 4, 2017, at Meridian High School in Laurel, Wash. Sen. Ericksen fielded questions from constituents during the standing-room only meeting as hundreds packed the auditorium beyond capacity. Topics ranging from water usage, water quality, renewable energy, and public education were discussed. 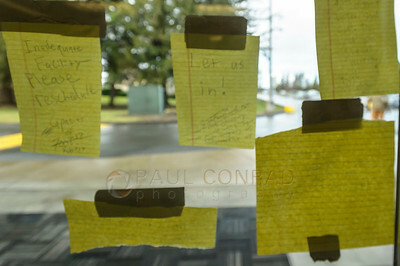 Handwritten notes on the door of Meridian High School as Sen. Doug Ericksen (R-Ferndale) answered questions during a town hall meeting on Saturday morning Mar. 4, 2017, at Meridian High School in Laurel, Wash. Sen. Ericksen fielded questions from constituents during the standing-room only meeting as hundreds packed the auditorium beyond capacity. Topics ranging from water usage, water quality, renewable energy, and public education were discussed. 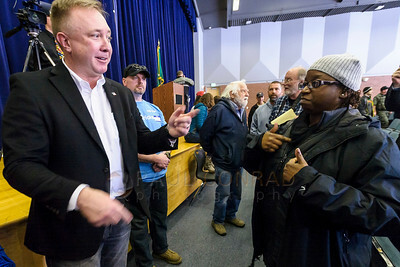 Images of a town hall meeting with Sen. Doug Ericksen (R-Ferndale) on Saturday morning Mar. 4, 2017, at Meridian high School in Laurel, Wash. Sen. Ericksen fielded questions from constituents during the standing-room only meeting as hundreds packed the auditorium beyond capacity. Sen. Ericksen fielded questions from constituents during the standing-room only meeting as hundreds packed the auditorium beyond capacity. Topics ranging from water usage, water quality, renewable energy, and public education were discussed.